I have been waiting at least six months to make this recipe, maybe more. I found it in an old Rachel Ray Magazine, but I knew store-bought tomatoes just wouldn't cut it in this case and I was months away from homegrown. Since nothing in this lasagna is actually cooked, the best quality and freshest vegetables make all the difference. You can find the original recipe here. I cut it down a little, but followed the general game plan. Slice the zucchini into 12 slices using a mandolin and toss with the olive oil. Combine the ricotta, 1 T of lemon juice, lemon zest and 1/4 t of salt in a food processor and blend until smooth. Remove to a bowl. Add diced tomatoes, sun-dried tomatoes, ginger, remaining 1 T lemon juice and 1/4 t salt to the food processor. Blend until smooth. Layer three slices of zucchini, slightly overlapping, on a dinner plate. Spread the ricotta mixture over the bottom, followed by the pesto and then the tomato sauce (use 2 - 3 T of each). Top the sauces with one slice of tomato and then repeat the layer again. Top with a few basil leaves, repeat the process for the second serving and enjoy! 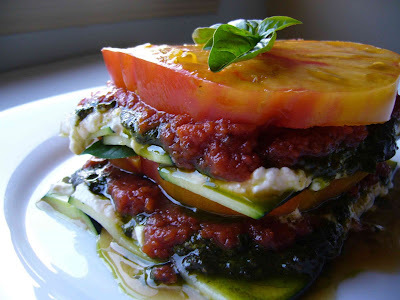 Your lasagna looks so fresh, summery and good1 Yum! What a clever lasagna dish... Your picture makes it look irresistible. I wish I would have stopped by your site before I made salad tonight! No bake lasagna is a fantastic idea...and your picture is lovely! I have got to make this tomorrow. This is a great idea! What was your take on this dish? Would you make it again? Do anything differently? I am definitely going to try this one. Hi Christine - I was actually really happy with the way it came out. Really flavorful and delicious. Just be sure to use homegrown, or really, really flavorful tomatoes. That's what makes the difference!